The PTX8807 features simplified integration for high performance EW and radar systems and provides its output power of up to 200 W over a 30-40 GHz range in the technically challenging Ka band. 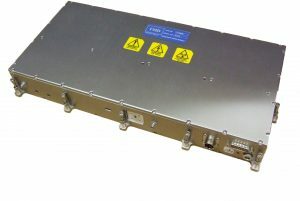 It comprises a high-power Ka band helix TWT and switched mode power supply to form a single ‘drop-in’ unit without the need for high voltage connections. Nigel Hann, TMD’s Head of Sales: “At TMD we recognised the urgent requirement for defence and security organisations to mitigate the worldwide threat imposed by the increasing use of higher frequency radars. Such high frequency technology is now becoming more sophisticated and the systems more difficult to counter jam – whereas earlier Ka band radar products were less reliable and technically advanced.